I'm surprised that this hasn't shown up in the tabloids or the 'net as an alien beacon or similar silly predictions. I did Tweet to NASA and the Dawn spacecraft that this looked like an X-File and that Scully and Mulder needed to investigate - all tongue in cheek of course! A week from tomorrow, March 8th, Dawn will begin manuvering to enter into orbit around Ceres to begin 5 months of observation. This will reveal Ceres in great detail and there will be much to learn and astound during that time. After the mission Dawn will remain in orbit around Ceres and we will be rewriting the textbooks on dwarf planets, the asteroid belt and the solar system in general. Stay tuned as we enjoy this voyage of exploration together. The interview will be broadcast by WTOP sometime between 7 and 9 a.m. EDT. ISS mission planners at NASA’s Johnson Space Center, Houston, Texas, will provide WTOP with the exact time in the very near future. WTOP wants you to submit your questions for Terry and Sam to our live blog. We’ll pick the best and ask Terry and Sam. You can follow ISS, Terry and Sam on Twitter as I do. Terry and Sam have Tweeted gorgeous and stunning pictures from ISS. By the way, you can actually see ISS fly over your location by subscribing to Spot The Station. It is a beautiful sight, especially when you realize you are looking at a million pounds of space hardware and six humans 250 miles up traveling at 17,500 miles per hour! Good luck with your question submission and be sure to tune in to this unique listening experience at WTOP. For those of us in the weird grip of this winter, take heart - Spring is 22 days away and I could smell spring as I shoveled snow this morning. With gray skies and white all around, take a peek at this video . Watch it in a darkened room with the sound up a bit and marvel at our planet and our ability to see it as we do in this video. Watch closely and you will see much in the sky and on the ground. Sorry I missed you yesterday but I was at NASA's Goddard Space FLight Center in Greenbelt, MD, catching up on my favorite spacecraft, Lunar Reconnaissance Orbiter (LRO). I visited with the LRO team - the mission director, the former chief scientist for the mission, the current deputy scientist, visualization experts and LRO herself (sort of). 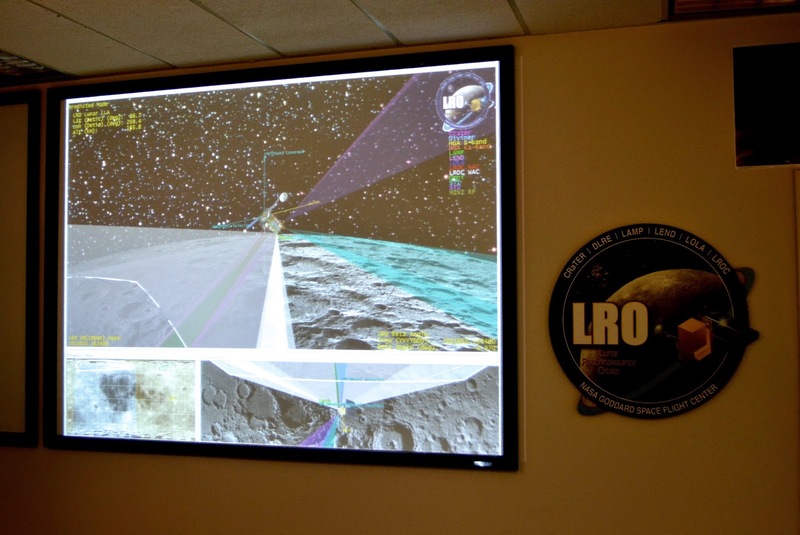 When I did the article in 2009 the operations center where LRO is monitored an controlled was not operational. Yesterday I was able to visit LRO's mission control room. While I was there LRO was over the North Pole of the Moon! To be exact, this picture shows that she was at 86.7 degrees N lunar latitude at a height of 165.8 KM. I could see the orientation of the spacecraft and the area of the Moon she was flying over based on prior pics taken by LRO. I have to say it was a surreal moment for me and one I will always remember. 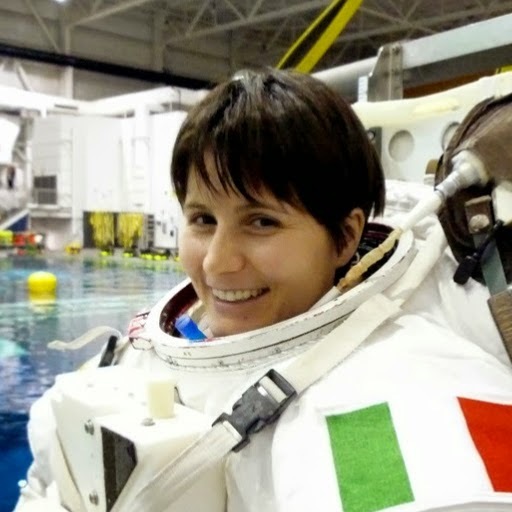 LRO is still doing cutting edge science and is in perfect health….she could last another 20 years. NASA currently has no funding for LRO in NASA's Fiscal Year 2016 budget which means that unless funding is found, LRO will cease operation effective 10/1/2015. This would mean that there would be no operational spacecraft in lunar orbit - and no one has plans to build such a mission that I am aware of. Other space agencies depend on LRO's instruments and science is done on LRO 24 hours a day, 7 days a week. New discoveries are being made and there are 100's and 100's of Terrabytes of LRO data being added to the already bursting amounts of data the spacecraft has collected in almost 6 years. We know the surface of the Moon better than we do our own planet thanks to the cameras and instruments aboard LRO. As I have blogged here the Moon is a VERY interesting world that has much to offer and is in my personal opinion, very important to humanity's future in space. You can keep up on LRO at Twitter, Facebook and of course on the web. Milky Way Galaxy - Wormhole Transporter? ANd then all hell broke loose with -1 temp - no wind chill - 9+ inches of snow AND ice. Took a few hours to dig out today. You have to read this science article about how our very own Milky Way Galaxy could be a wormhole - can you say Interstellar - transport system. 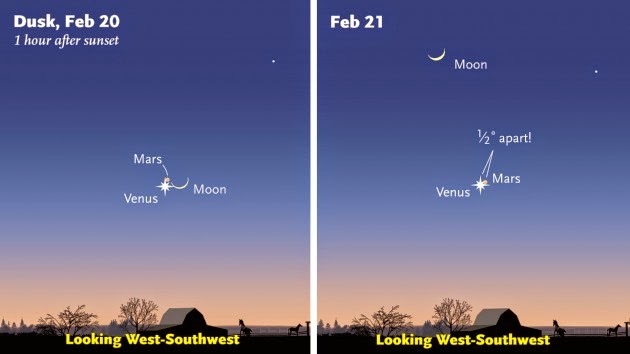 If you have clear skies on 2/20 and 2/21 be sure to look at the triple pairing in the western sky after sunset of Mars, Venus and the thin Crescent Moon. This will be a pretty sight to see. Today, February 18th, marks the 85th anniversary (OK, I called it birthday) of the discovery of the dwarf planet Pluto by Clyde Tombaugh. I wanted to share with you this autographed picture of Clyde, artist's rendition of Pluto and its largest moon Charon, and the actual discovery slides. Clyde gave a talk back in the late 80's at the Chabot Observatory in Oakland, CA and I attended. He was graciously providing autographs and the picture at a minimal charge to help raise funds for the Chabot Observatory so I couldn't refuse. I need to get a new frame and glass in 2015 so I can hang it while New Horizons is enroute for the historic Pluto encounter. Clyde was a true gentleman and it is fitting that he is with New Horizons for the Pluto encounter and follow on mission. The Dawn spacecraft is closing in on the dwarf planet Ceres and getting ever better pics while doing so. The latest pics are from about 52,000 miles away and show the icy world as being heavily cratered. 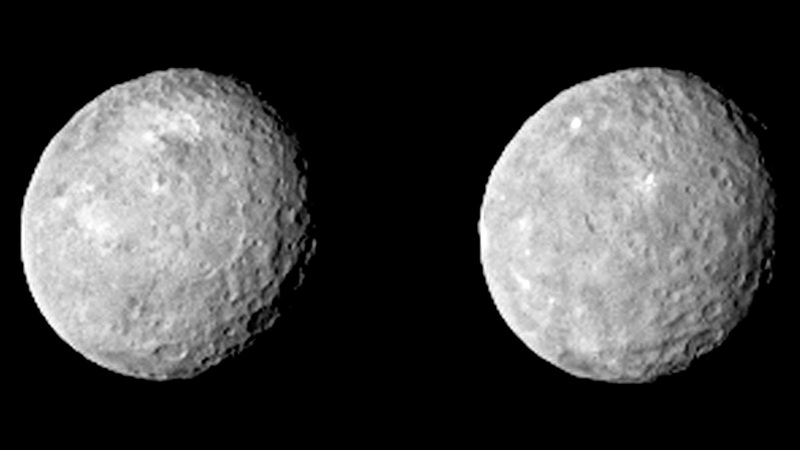 The two pics below show the rotation of Ceres. I'm rather convinced that the white spots we seeing are fairly new impact craters that are showing ice that lies underneath the surface. There seem to be few major features so far except for the craters which is in direct contrast to the amazing world we saw in Vesta, Dawn's previous destination. Dawn is due to rendezvous with Ceres on March 6th and enter into orbit to start a 5 month science mission. The science gathered from visiting these two largest worlds in the asteroid belt will go a long way in helping us to understand the birth and evolution of our solar system. Here is the link to the first photos of the flyby. Pretty amazing! The European Space Agency (ESA) successfully maneuvered their Rosetta spacecraft to a 6 kilometer (less than 4 miles) close flyby of the periodic Comet 67P/Churyumov-Gerasimenko - Comet 67P for short - this Valentine’s Day at 7:41 a.m. EST. The spacecraft passed over the larger lobe of the twin lobed comet, called the Imhotep region. The flyby is Rosetta’s closest approach yet to the comet and will collect scientific data and take an amazing collection of photographs that should be available to the world on Monday. I can hardly wait for the detail on these pictures because what we have seen so far have been better than any science fiction depiction of the surface of a comet - remember the movies Armageddon and Deep Impact? Rosetta was launched in March 2004 and made 3 flybys of Earth and 1 of Mars to pick up enough speed to intercept Comet 67P last August and entered into orbit around the comet. Its Philae lander detached and landed on the surface of the comet last November and endeared itself to humanity with Tweets and amazing scientific feats of discovery. Rosetta will give us our best view and data ever of a comet, a leftover from the formation of the solar system 4.6 billion years ago, Comets contain the original material of our solar system, the elements, molecules, gas, dust and ices that weren't used in making the planets or dwarf planets. What sets Rosetta apart from previous cometary missions of the past is that for the first time we will orbit a comet and land on it instead of a one and done flyby mission. What is really thrilling to me is that we will have an up close and personal view of Comet 67P/Churyumov-Gerasimenko transforming from an inert icy dirt ball into a full fledged active comet spewing off gas and dust due to the intense heat of the Sun. As the Rosetta mission progresses we will see how the comet changes as it approaches the Sun, begins to heat up, passes closest to the Sun in August 2015 and then begins to shutdown as it zooms away. An array of instruments are on the orbiter and lander, including 3 from NASA that are gathering a treasure trove of never before acquired data and pictures during these critical stages in the life cycle of a comet’s journey around the Sun. 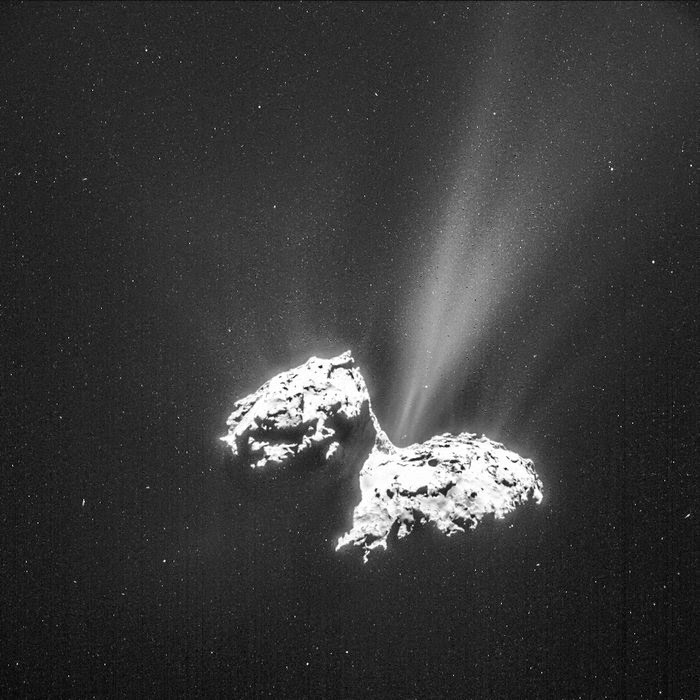 Already Rosetta has rekindled the debate about comets being the source of water for Earth’s oceans. Rosetta’s analysis of the water vapor coming from Comet 67P did not match that of the water in Earth’s oceans. It now seems likely that asteroids were the source of the water in our Earth’s oceans. The upcoming rendezvous of NASA’s Dawn Mission with the dwarf planet Ceres in the asteroid belt may provide more answers. There are over a trillion comets and millions of their believed to be siblings, asteroids, in the solar system. The more we learn about them the more we learn about our origins. It is possible that comets and asteroids seeded the primitive Earth with the necessary precursors for life. We know that comets and asteroids have impacted the Earth in the past and will do so again in the future so anything and everything we can learn about them is beneficial not only for science but survival as well. You can follow Rosetta too via the @ESA_Rosetta Twitter account. If you are a fan of the movie "Interstellar" and black holes, then this is YOUR link. 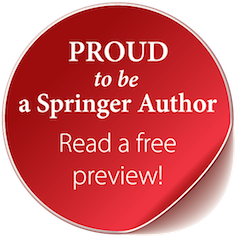 Watch the video and you can read the submitted science paper as well. Getting ready for FRIGID TEMPS in VA. Play it LOUD & PROUD! CHeck out this GREAT link and video on NASA's new Solid Rocket Booster (SRB) for the Space Launch System (SLS). It has great info and gives you a never before seen view into making the new 3.6 MILLION pound thrust rocket. You will want to read this latest research about comets and active asteroids. The line is getting blurred between asteroids and comets. It could turn out that they are defined as to the particular state they are in. An ice covered asteroid gets close to the Sun to become active while a comet loses all of its volatiles (gas) to become an asteroid like object. Here's an interesting story on our planet's inner core. Thought this was a good followup to yesterday's blog. Had a great time last night at Northern Virginia Astronomy Club (NOVAC) giving my talk on "The Future of U.S. Manned Spaceflight". People are interested in their space program, believe me. There was a great New York Times article published on Sunday that discusses the ongoing question of what killed off the dinosaurs 65 million years ago. It basically comes down to an impact event and/or a major volcanic event. What IS certain is that the impact and volcanic events DID happen AND the dinosaurs DID die. Only time and hard scientific evidence - if it can be found - will tell us the truth. If you are out and about after sunset any time soon and look at the sky you will see two bright planets. Venus is dazzling in the Southwestern sky as it gets dark and cannot be missed. It is well placed for viewing in the sky over the next few months and will have some interesting alignments with the Moon and the planet Mars this month that I will be writing and Tweeting about. On the other side of the sky you will see bright Jupiter in the East. Today it is directly opposite the Sun and will be visible in the sky for the whole night for the coming weeks. Jupiter is 36 light minutes from Earth which means it took the reflected sunlight that you are seeing form the planet 36 minutes traveling at 186,000 miles per SECOND (the speed of light) to reach your eye. When you look at Jupiter see what time it is and subtract 36 minutes, that will tell you what time the light left Jupiter to travel over 400 million miles to you. Binoculars can show the 4 main moons discovered by Galileo on January 7th, 1610 but a telescope is best. The moons change their positions from night to night as they orbit Jupiter and the Hubble Space Telescope (HST) just took a spectacular picture of a rare transit of three of the moons across Jupiter as seen from Earth. Another solar system object, the dwarf planet Ceres, has been in the news the past few days including a report by WTOP’s Dave Dildine. NASA’s Dawn mission is closing in on a March 6th rendezvous with the largest object in the asteroid belt which lies between the planets Mars and Jupiter. 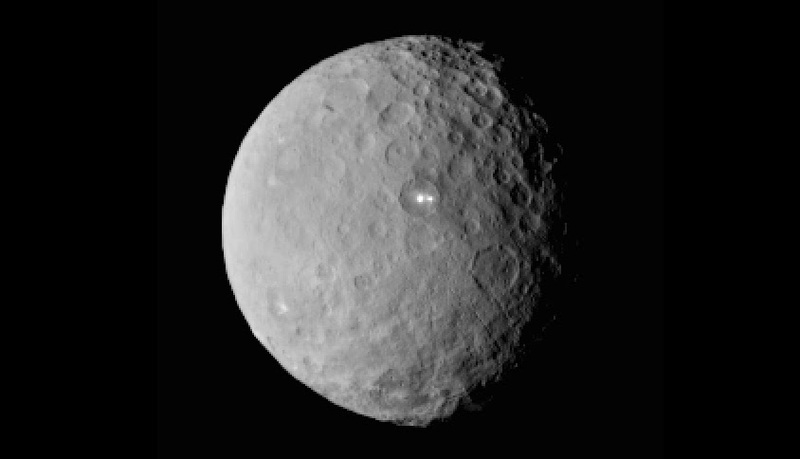 Dawn will orbit Ceres for five months. Originally classified as an asteroid - a left over remnant from the formation of our solar system 4.5 billion years ago - Ceres was upgraded to dwarf planet status, just like Pluto. On February 4th Dawn took amazing pictures, the best ever, of Ceres from a distance of only 90,000 miles. These pictures show mysterious white spots, craters and Ceres’ rotation. These views are only going to get better and better as we get ever closer to Ceres and enter orbit. Ceres is also thought to contain more fresh water than our entire planet! A fitting possibility for a world named for the goddess of agriculture and where the word “cereal” came from. The intrepid spacecraft, which also visited and orbited the giant asteroid Vesta for over a year, is powered by an ion propulsion engine. This hyper-efficient mode of propulsion allowed Dawn to be the first spacecraft ever to visit two different worlds in the asteroid belt. Another amazing mission that has been almost 10 years in deep space is NASA’s New Horizons. 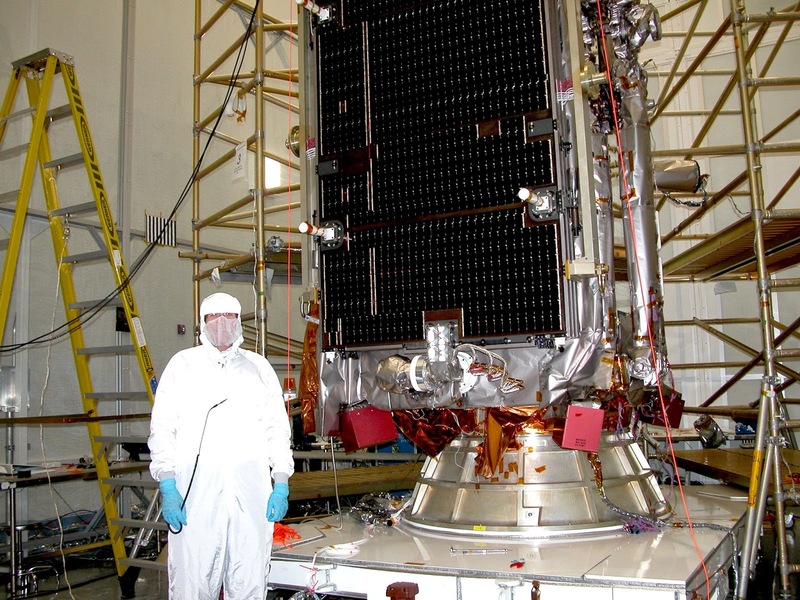 Our very own Johns Hopkins University Applied Physics Laboratory (APL) in Laurel, Md., manages the mission for NASA's Science Mission Directorate and designed, built and operates the New Horizons spacecraft. My alma mater, UCLA, is responsible for overall mission science. This spacecraft has travelled over 3 BILLION miles enroute to a historic flyby on July 14, 2015 of the dwarf planet Pluto and its various moons. On February 4th New Horizons took new images of Pluto and its largest moon, Charon. 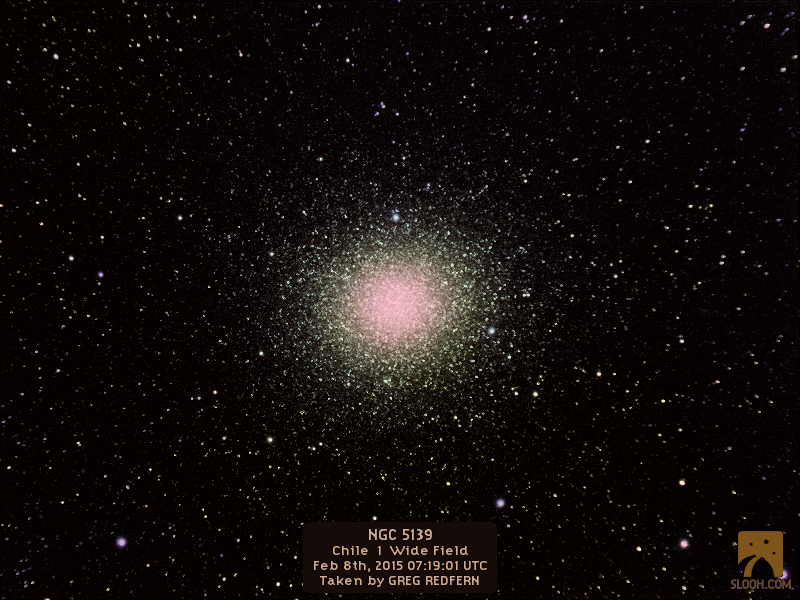 The images come on the 109th birthday of Clyde Tombaugh, who discovered the distant icy world in 1930 while working at Lowell Observatory in Flagstaff, AZ. 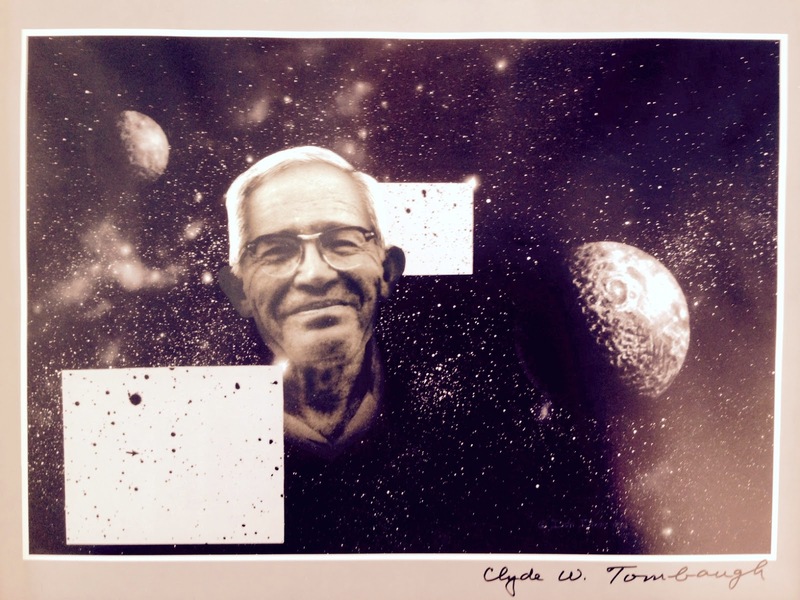 Clyde, whom I had the pleasure to meet and have autograph a Pluto-Charon print, would have been 109 years old. Some of his ashes are carried by New Horizons, a fitting tribute to a fine astronomer and human being. Finally, I wanted to give you a heads up, a slight pun intended, on the European Space Agency’s (ESA) Rosetta Mission that has captured the world’s attention these past few months with its sci-fi quality pictures of Comet 67P/Churyumov-Gerasimenko or Comet 67P/CG. Rosetta will swoop down to a distance of less than 4 miles on Valentine’s Day and give us a bounty of scientific data and images. I can hardly wait to see the returned images from this close encounter of the cometary kind as I have been spellbound by the clarity and detail of the images we have seen so far. Comet 67P/CG is getting closer to the Sun and is becoming active in that there are jets of gas and dust streaming from the comet due to the increased heat from the Sun. Rosetta will fly through these active areas to “sniff or taste” them with the spacecraft’s instrument payload. The data will give us an idea of the composition of this icy and dusty left over from our solar system’s birth. As you can see much is going on in the solar system and our skies. I’ll be giving a presentation on the “The Future of U.S. 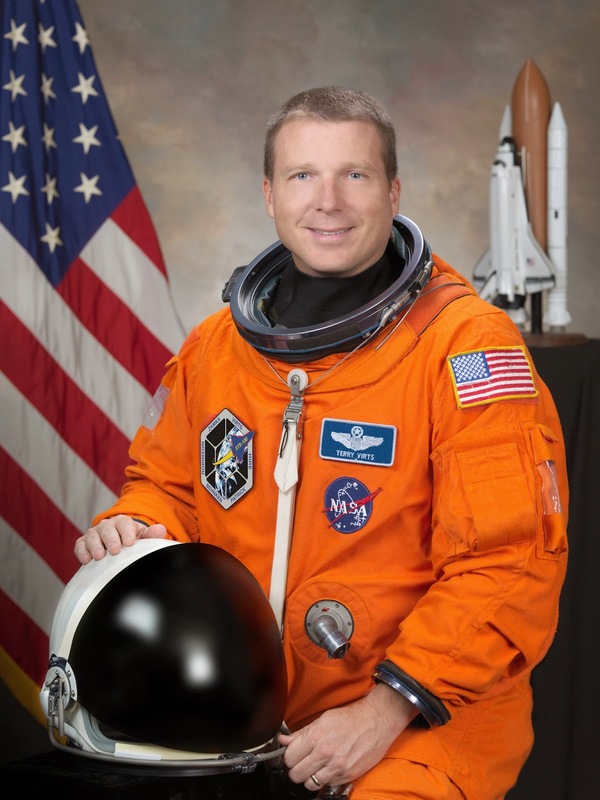 Manned Spaceflight” at the Northern Virginia Astronomical Club (NOVAC) this Sunday at 7 p.m. at George Mason University. Here is the best view yet of the dwarf planet - AKA largest asteroid in the asteroid belt - Ceres, taken 2/4/15 by the Dawn spacecraft at a distance of 90,000 miles. The view is only going to get better day by day as Dawn closes in on Ceres for a March 2015 rendezvous and orbital insertion. Dawn will then begin long term science operations. Astronomers have obtained a new view of the famous Trifid Nebula, a conglomeration of gas, stars and dust located in our Milky Way Galaxy near its center. The Trifid is about 5,200 light years distant from Earth. 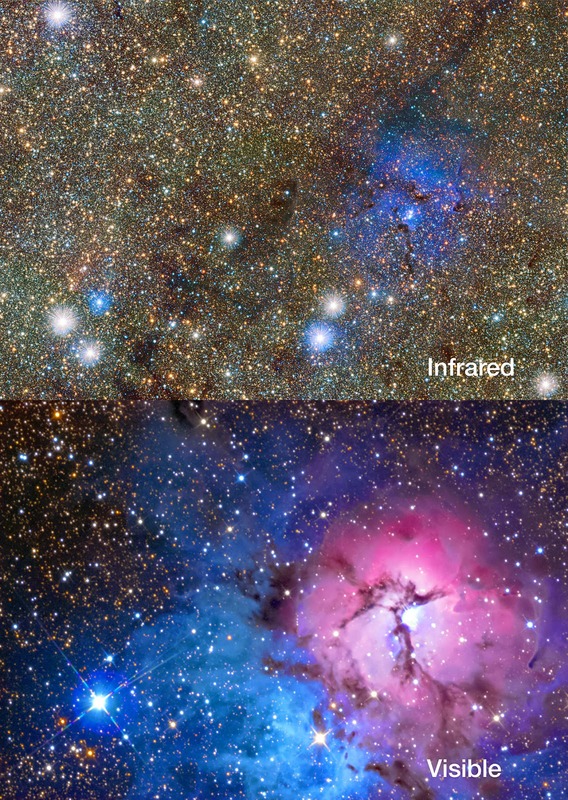 Using the ability of infrared light to penetrate dust astronomers were able to "see through" the Trifid Nebula to observe areas of our galaxy never seen before. You can details and pics here. NASA is slated to get $18.5 billion dollars for its Fiscal Year 2016 budget as proposed by President Obama. It is an increase of about $500 million over FY2015 but must go through the budget process - read Congressional approval - before it becomes law. I am still reading the many pages BUT I am concerned that Lunar Reconnaissance Orbiter (LRO) is on the chopping block, i.e., no funding starting 10/1/15 - the start of FY 2016. Sorry to be out of touch the last few days but I just returned from attending the funeral for a dear, dear, friend who lost his brutal nine month battle with a rare and aggressive form of cancer. The next heartbeat is a privilege and not a right so make sure you live each day to the fullest and do what you want to do - your time on this planet is not infinite……..
You may remember last year's mega-announcement in March about the discovery of gravitational waves in the data acquired at the South Pole by BICEP2. At the time there was talk of Nobel Prize and this being a great discovery. The announcement was done before any formal paper was published and/or peer reviewed. Now that such a necessary process has been done it turns out that the all important signal could be caused by dust from our very own Milky Way Galaxy. 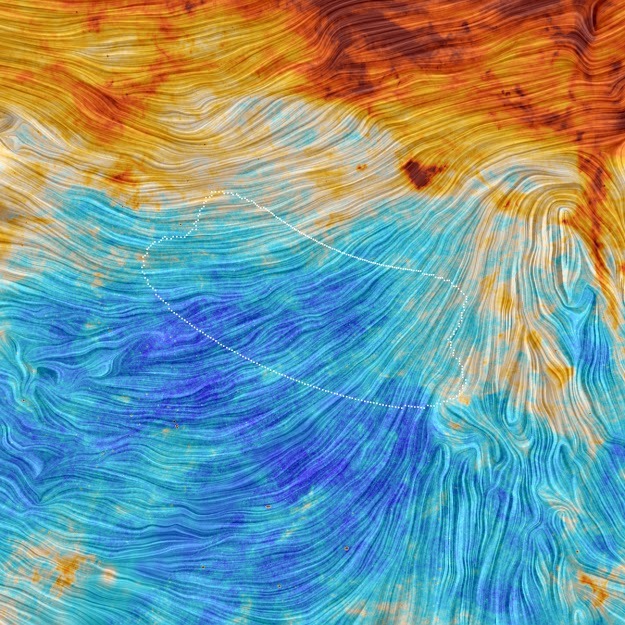 Read these illuminating articles http://blogs.discovermagazine.com/crux/2015/02/02/bicep2-discovery-gravitational-waves/#.VM-78Uv3XUl and http://sci.esa.int/planck/55362-planck-gravitational-waves-remain-elusive/.